The electric roof works fine and the hard top makes it fine to use in the winter. Its mot'd till June but it should go through the next one without too much of a problem. It has a Parrot hands free system fitted which works fine and is very easy to use. It will be strictly sold as seen no warranty given or implied although it will be sold with the best intentions and 1 years mot. the odd age relation on body and carpet. Here is a detailed and honest review of our bmw 330 d m sport convertible. Beautiful looking bmw 120d convertible. 59 plate (2009). Red leather interior. Front and rear parking aids with visual distance on screen. Heated leather front seats, heated leather steering wheel.isofix rear seats. MOT passed LAST WEEK (next due 22 April 2020). Cash or transfer (once cleared) only. 2 marks to front bumper (patch of paint missing following over zealous car wash), 1 to rear. 1 washer cover missing. Here for sale is my BMW 330d hardtop convertible with all the extras including.. Satnav, 18inch alloys, flappy paddles gears, cd player with usb and aux, heated seats, full electric windows, front and rear speakers, sport mode and the roof goes down with the key fob. I am reluctant to sell this but my circumstances have changed and I require a 4 door with 5 seats. It has done 113000 miles but still pulls like a train in every gear. There is some age related marks and scuffs and I have reduced the price to reflect this, also over the past few days it has developed a slight whistle on the turbo and I have dropped the price by 1 thousand to reflect this so absolutely No tyre kickers or time wasters please. This is a real stunning car and a head turner. MB car sales - Visit us for a test drive - Call us on 441480272323 or click here to find out more. NUMBER PLATES NOT INCLUDED. ONLY DONE 4000 MILES IN THE LAST 12 MONTHS. GOOD TYRES. Heated leather full electric seats. All paperwork books and 2 keys. Auto head lights and wipers. Phone connectivity Bluetooth. On top of this you have. 58 BMW 320D 2.0 SE MANUAL IN RED. Leather Trim. As per the photos a nice example for the age and miles. Add this to your watch basket. All details of this current vehicle are listed below. If this does not sound like you then you might want to consider buying your vehicle elsewhere. Met Black, 2 owners, 40426 miles, fsh. 2009 BMW 118D CONVERTIBLE FINANCE AVAILABLE FROM £105 a month WARRANTY CARD PAYMENTS AVAILABLE SERVICE HISTORY JUST BEEN SERVICED 83K MILES MOT 12.11.2019 £120 TAX 6 SPEED MANUAL £4999. Selling my beautiful BMW which I have owned for 7 years. It's been a lovely car never had any problems what so ever. The car is immaculate inside and out. I'm very sure you couldn't find a better example. Looks stunning in Montego blue with 19" wheels. M sport bumpers with a front splitter. Full service history some BMW. Car will have a full years MOT once sold. I'm only selling due to upgrading. Has been into BMW main dealer for fuse box recall /inspection. Car has been in the family since new. Auto Lights. Auto Wipers. SUPERB EXAMPLE. FULL HEATED LEATHER. VERY NICE. 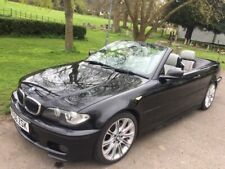 2006 BMW 3 SERIES 2.0 M-SPORT CONVERTIBLE MANUAL REMAPPED!! Has been remapped and is very quick! MOT till 13 august 2019. 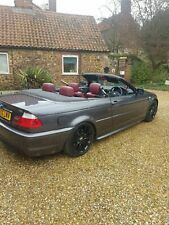 Well looked after BMW 3 series convertible. Make - BMW. Convertible roof in mint condition. Transmission - MANUAL. Electric windows. Electric roof.